EA – 2015 Class – UNITY, Inc.
For my Earth Day project, I helped to coordinate an Earth Day event with the Environmental Department I work for on the reservation to help spread awareness on these Earth-related issues. A lot of planning and organizing went into this. We had to pick a date that would be best to have it on, a place to have it (somewhere where it was most accessible to our target audience), activities that would be held there, food, and vendors. My name is Nadira Mitchell, I am 14 years old. I finished 8th grade at Utterback Middle Magnet School for the Arts and will be attending Tucson High School in the Fall as a freshman. I am Navajo (Dine) on my mom’s side and Anglo-American from my dad’s side. Helping the community through volunteering, doing community service, getting involved in extra-curricular activities at school and setting a goal and working hard at achieving my goal has helped me to become a better leader. I am a Junior Docent with the Arizona-Sonora Desert Museum’s Teen Conservation Leadership Corps, interpreting to visitors the flora and fauna of the Sonoran Desert and assisting with camps during the summer. I like science, music and photography and hope to combine all those as I continue to develop my leadership skills as a UNITY Earth Ambassador. What I’ve done in the past to become a better steward of the environment is I have participated in community clean-ups and cemetery clean-ups. In the future i want to change policies for smoke free parks. An estimated 4.5 trillion of the annual 6 trillion cigarettes sold worldwide do not end up in a dust bin or ashtray, but are simply flicked away along roadside or on pavement. The ban on indoor smoking may have exacerbated this. (Source: Current Environmental Heath Reports) Also I’d like to raise awareness about the Rio Yaqui water rights issue. My name is Jessica McCool. I am 18 years old and will be attending Chapman University where I will study Sociology. I am part of the Santa Ynez Band of Chumash Indians in California and work as an Environmental Intern for the Santa Ynez Chumash Environmental Office. I am a White House Tribal Youth Ambassador, a Center for Native American Youth Ambassador, and am currently a member of the White House Tribal Youth Gathering Youth Steering Committee. Youth have the potential to be the trail makers of a cleaner and safer environment because today, so many are ambitious and willing to take that leap. These past years I have been able to meet and develop friendships with many people through the projects offered here in our community. Many of these are young and inspiring individuals. The inspiration you see in their eyes and the commitment they strive for when it come to a cause as this, is overwhelming. Our youth can be environmental stewards by motivating their peers and families to make the best choices there are when it comes to protection of our resources. It starts with my younger brothers and sisters who show interest in learning about how our earth lives every day. Showing them that we all benefit; sometimes too much, from our earth. In order to preserve this planet and ensure that our children have clean water to drink and fresh air to breathe, it’s essential that we begin acting now. It starts personally, by taking shorter showers, using reusable shopping bags, replacing light bulbs with CFLs, and other small steps. Then there is the larger ones like pushing legislation that encourages environmental protections (while also respecting indigenous rights). As Native peoples, we are inherently political; our existence is tied to treaties which define us as sovereign entities. As such, it is essential that we exercise that responsibility. There are cases where legislature and the politics that colonialism and brought us will not work. In these cases, there is not always an easy answer. But I have faith that my indigenous brothers and sisters will physically protect our mother earth if ever a conflict arose. Keystone XL will be stopped with Native-made road blocks (if the idea doesn’t trickle away on its own). Indigenous youth must also make every effort to be well spoken. We must walk in the world of a colonial nation and our traditional worlds. We must represent ourselves as ambassadors and advocates and interpreters. We should strive to become educated in math and science and culture. Our minds are our bows and arrows and our cultures are our shields. As Native youth, we must always remember that a good planet is mighty hard to find. SuSun Fisher is a proud member of the Confederated Tribes of Siletz Indians of Oregon. At the age of 16, Miss Fisher represents her Tribe as Miss Siletz 2014-2015 and is currently on her 3rd reign as tribal royalty. She attends Chemawa Indian School where she will be starting her junior year this fall. SuSun is very active within her community. She is Female Co-President of the Siletz Tribal Youth Council and a member of the Chemawa Youth Coalition that plans activities that benefit the environment and community. In 2014, she was chosen as a UNITY “25 under 25” youth leadership award recipient. This past December she was selected as a Youth Ambassador for the 2014 White House Tribal Nations Conference. As a UNITY Earth Ambassador, SuSun intends to plan events and projects concerning the environmental issues in her community. She believes this will be a great opportunity for not only herself, but the youth in her community to become more aware of the environmental issues of their native lands. SuSun is excited to work with her fellow Earth Ambassadors and youth on creating great change within each community. I am Birk Albert, Koyukon Athabascan and an enrolled member of The Native Village of Ruby. I was raised in roadless Alaska by the Yukon River in a small village of 170 residents. My family lives a subsistence life in a log house heated only with wood heat and no plumbing. My dad is one of the last traditional snowshoe builders. I attended a school with about 40 students in K to 12. I enjoy creative writing (GenIzine.blogspot.com) and studying history as well as outdoor activities in the Adirondack woods. I learned never to give up from my dad and his family and my mother taught me empathy and the value of impacting the lives of others. My future will always have me giving back to Alaska and my Native community. I want to be a good ancestor. I am humbled to be chosen as an Earth Ambassador as well as invited to the first White House Tribal Youth Gathering. 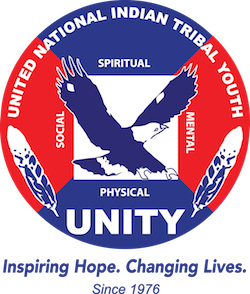 I may now be raised by more than one village, but I have UNITY to thank for introducing me to other Tribal Youth peers across America. Congratulations to all member of the class!